Having undoubtedly reached the point of infamy in the Canadian music scene, Finger Eleven was a household name throughout the 2000s. Making huge waves with mega-hits like “Paralyzer” and “One Thing,” the Ontario rockers made their mark. Coming from humble origins way back in 1989, the band is still alive and kicking, most recently releasing their latest record, Five Crooked Lines, back in July. A lot has changed since 1989, both within the band itself, and in the greater Canadian music scene, but lead guitarist and founding member of Finger Eleven James Black assures us that the band is just as spirited now as they were back when it all began. “We just wanted the record to feel as simple as it would be you came and saw us at a little stage somewhere. It was just about reducing everything, not being as produced as the previous record,” Black says. Stripping away the impact of over-production gave the band a chance to get back to the basics of their sound, creating an album that is authentic to the core. Black notes the importance of remaining true to your sound, and not letting external factors interfere with the dynamic of the group. “We can’t let inertia, gravity, the rest of the world, whatever, start to mess with the sound of our band” Black explains. The factors Black mentions are no doubt tied back to the pressure placed on the band to continue performing at the same level as their 2000s high point: winning a Juno Award for Best Rock Album back in 2008 for their hit Them vs. You vs. Me. Five Crooked Lines is about returning to the sound they captured back in 1989, disregarding the pressure to continue rifling off radio hits for the masses. 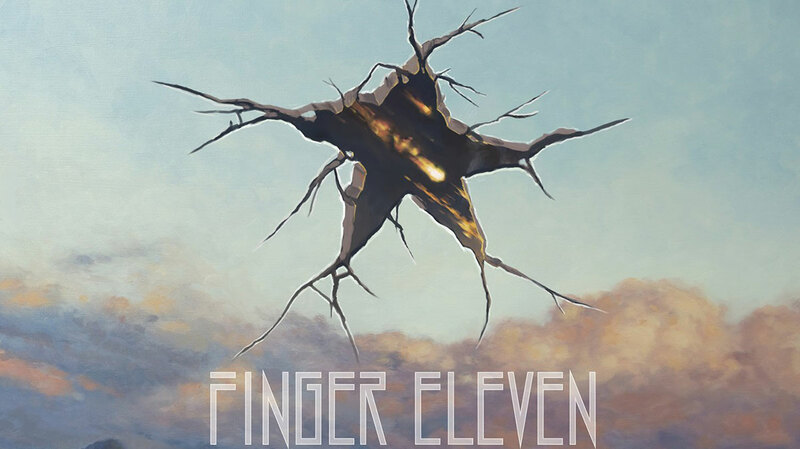 Make no mistake, Finger Eleven getting back to the basics is not a regression in their sound, having been around for so long, they have continually evolved to stake their claim in modern music. Attempting to fight over the impact of over-production while simultaneously taking advantage of modern equipment is no easy task, but Finger Eleven seems to have succeeded with Five Crooked Lines. We may never see Finger Eleven reach the same heights as they did back in the “Paralyzer” era, but we can look forward to experiencing a version of the band that is, above all, authentic. Nothing is more important in art than authenticity, and with the release of Five Crooked Lines, Finger Eleven have it in spades.